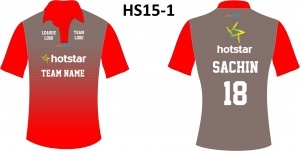 Scroll below for Hotstar Jersey Designs. 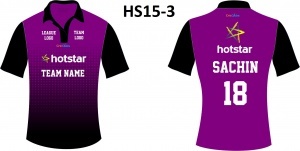 Do you want to order Team Jerseys for a future date (before 30th April 2019)? 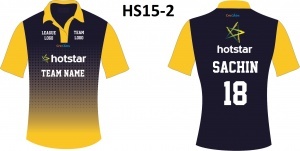 Just send us an email to stores@cricclubs.com with subject “Future Delivery of Order for Hotstar <YOUR TEAM’S PROMO CODE>” and provide an approximate future date of delivery, we will give you a CricClubs Credit which can be used before April 2019. Do you want to place order for your Team Jerseys right away? Select a design from the designs available below (scroll down). Identify the design number for the design you want to move forward with. Download the MS Excel template available here. 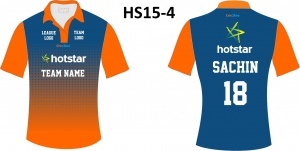 Complete the template with your team’s information such as Your Team’s Promo Code, selected jersey design number, logo information, Team name, shipping address, Names of Players, Numbers, Jersey Size etc. Completed excel template file you downloaded and attach it to the email (fill both Summary and Detail worksheets in the file). High resolution logos of your team and/or your league to be placed on the design. Please note, low resolution images will jeopardize quality of your team jerseys. Additional Jerseys (beyond 15) can be included in your order at $10/jersey. Trousers and Caps can be included in your order at $8/Trouser and $5/cap. Minimum order quantity of 15 required. Our Apparel team will review and respond to your email with the confirmation of the intake. If all info is available, we will send design proof of your order to your email. Once design proof is finalized and approved, we will add your order to the production queue. For any additional questions, please contact us at stores@cricclubs.com and provide your Team Promo Code in such communications for faster responses. Can our team add more than 15 team jerseys to our order? Yes, absolutely! First 15 jerseys are Free. Each additional Jersey will be charged at a discounted price of $10 / jersey. Can we add Pants or Caps to our order? Yes, you can add Pants or Caps to this order. However, each Pant will be charged at discounted price of $8/pant and $5/cap. Minimum order quantity is 15. How long will it take to deliver the order? Due to overwhelming demand, we are anticipating that it may take between 4 to 6 weeks to deliver the orders. Can we get own design on the Jerseys? Unfortunately, due to the high demand and approvals from Hotstar, we are unable to offer designs other than the ones provided for this promotion. What happens once we place the order? Our team will review the information shared and respond to your email with a jersey proof using the info and logos you provided. Once you approve the design, we will put it in the production pipeline and provide you with an expected delivery date. Do we have to pay for shipping of the order? Shipping is part of the deal. We do not charge anything separately for shipping. What sizes can be ordered? We have additional questions, how do we get them answered? Please send your questions to stores@cricclubs.com.